So you've seen those cool QuickTime VR movies on the web and you want to learn how it's done. Well, you've come to the right place. Internet Brothers to the rescue again. We'll be talking about creating panorama movies here, the kind you can move from side to side up to 360° as if you're standing on the spot where the panorama was captured, spinning around. There is another type of QTVR image, the object movie, where you can spin an object around to view all sides. We'll leave that discussion for another time. If you're not quite sure what we're talking about, we'll send you to Colorado Bro's site to have a look. Note: the free Apple QuickTime® browser plug-in is required. The first thing you need to do is find a nice spot to take photos and create a panorama with your camera. We've discovered it works best if you're on top of a multi-directional vista, or in the bottom of a valley or bowl. Think of a sine curve. But be careful when you turn. We don't want you to start out at the top and end up at the bottom. It's hard on your camera. It is a good rule of thumb to have a 50% overlap from one image to the next. In other words, take three photos to capture the width that could actually be done with two. Panorama software uses the overlap to help blend the two images together. The more overlap there is, the smoother the transition between images and the more seamless they appear. Another advantage of having a full 50% overlap between images is if something happens to one of the photos, you can still salvage the panorama — although it might be difficult to make it appear seamless. That said, our camera using a 35mm lens takes 18 vertical images to capture 360° with 50% overlap on each image. This would require fewer images with a wider angle lens such as 20mm, and a larger number of images with a narrower angle lens such as 55mm. You should shoot the images vertically, allowing for a taller perspective in the finished product. You can shoot horizontally but you'll end up with a vertically narrow scene. Using a tripod makes this whole process much easier. Although it is possible to do without one, we don't recommend it. 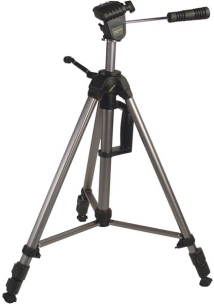 Most tripods have markings at the point where they rotate, helping to determine how many degrees the camera is pivoting with each turn. If yours doesn't, there are several manufacturers including Kodak, Bogen and Kaidan that make special panorama tripod heads for just this purpose. In addition to having the very handy degree markings, these tripod heads are designed so that your camera rotates around a central axis, meaning the focal point of the lens remains aligned from frame to frame. (This is a significant detail only if you're trying to achieve perfection, or are very close to your subject.) Panorama tripod heads make the job of taking the many photos for a panorama much easier, but they aren't cheap. We suggest you experiment without it first to see if panorama photography is really going to be your thing. Avoid photographing long, straight objects like a freeway for your panorama because of the warping affect a camera lens has on an image from edge to edge. Exposure is very important in creating a seamless panorama. Modern auto-exposure cameras can actually create a problem in this respect. As you're moving the camera from shot to shot, the auto-exposure will make an unintended contrast adjustment based on how the light meter perceives the brightness of the scene. For example, we had a recent problem with this when there was a glare flare in the center of one of the images. The camera's light meter shortened the exposure time significantly when it saw the flare, making that image much darker than the rest. If possible, use a camera that doesn't have auto exposure and set the lens and shutter speed to achieve a happy medium based on the average brightness of the scene. Always avoid shooting your panorama when there are moving clouds directly overhead. If the clouds move and the sun shines on you or your subject halfway through the process, the exposure will suddenly change, making for a lousy panorama. Avoid photographing long, straight objects like a freeway for your panorama. Because of the warping affect a camera lens has on an image from edge to edge, particularly a wide angle lens, a straight line will look bent or curved in the panorama. You don't want to give your audience vertigo; or do you? Proceed to part 2 of the QuickTime Panorama tutorial — The Computer Side.